When you’re a small business owner, often your business life becomes just an extension of your personal life. 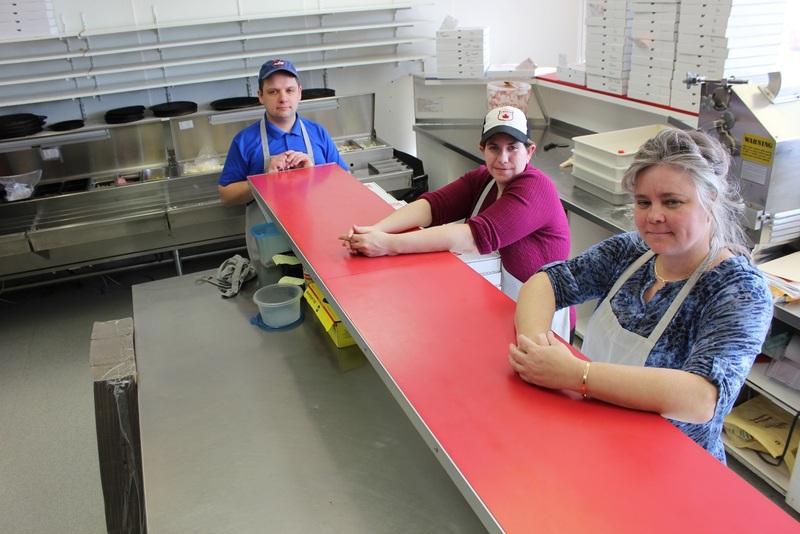 Slice’s Pizza on Portage Avenue is a perfect illustration of the dedication that smaller business owners have to their business and the close-knit atmosphere among the people who work there. Joel and Jack Kurkjian have owned the restaurant together since back before they were married. The two owners met in their teens and opened the restaurant a few years later. However, the demands of running a new business kept the pair too busy to even think about a wedding. Finally, after a little over a half decade, they set a date. The night before Joel and Jack got married was a tricky affair. Pink Floyd was in town that night and they had been given tickets to the concert. After show, it was straight back to the restaurant to catch the late-night rush. But only Jack could work after midnight. It was a busy shift and Jack ended up staying until four in the morning. With help from Ted, Joel’s uncle (and the restaurant’s longest running employee), Jack spent the first four hours of his wedding day tossing pizza dough and spreading toppings. With stories like that, it’s no wonder Joel characterizes their restaurant as a “family-oriented” business. As the business has grown, it hasn’t lost that close-knit charm. Kids who began coming to the restaurant with their parents now have kids of their own. There is a clear family vibe behind the counter of the storefront at Portage and Valour too. Joel and Jack now manage two locations and their son Cameron will soon be joining the crew. Sara and Ted are the pros behind the counter working alongside many wonderful staff. Ted has been making pizzas at Slices for over two decades and Sarah has been there for over five years. Slice’s popularity extends beyond the West End. Not only do they serve customers walking from the nearby neighbourhood, but also people driving from around the city. The restaurant has even served as a set for the movie Goon about a minor-league hockey enforcer. Slice’s has two locations in the city and the Kurkjians plan to open more locations in the future, but what matters most according to Joel is keeping the business about the neighbourhood and about the families. If you’re in the mood for pizza you can give Slice’s Pizza a call at (204) 255-5555 or stop in and have a pizza made fresh at 1329 Portage Avenue at the corner of Portage and Valour Street. Any way you Slice it… it’s great!